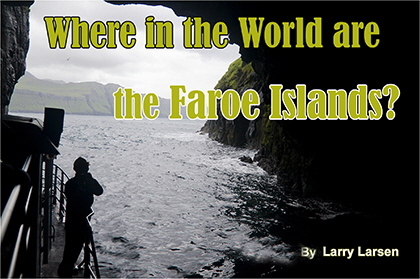 Where in the World are the Faroe Islands? This could be a great trivia question. This set of 18 islands, belonging to Denmark, is located halfway between Iceland and Norway in the Northern Atlantic Ocean. 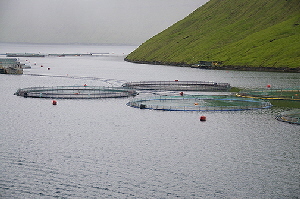 Many of the inhabitants are of Norwegian/Scottish/Danish descent and speak a dialect called Faroese. They are some of the friendliest people we have ever met. Geologically, the islands with an average height of around 1,000 feet are very interesting. They are remnants of a volcanic plateau about 60 million years old. The layers of lava and ash over the millions of years give the islands a distinctive layer-cake look that is very unique. Amazingly, the small amounts of coal discovered are derived from relatives of the giant sequoias of the western U.S.
After our Celebrity Eclipse cruise ship arrived in the port of Klaksvik, a town of 5,000 inhabitants, we took a bus tour to the even smaller Vestmanna township, where we boarded a boat for an excursion to the Vestmanna Seacliffs. Much of the landscape along the way reminded us of parts of Ireland and New Zealand – beautiful green pasturelands with many rocks and few trees. We could see sheep perched on the high mountainsides and scampering down precarious cliffs to eat seaweed by the water. Several homes and farms on these islands had roofs "made" of grass, definitely a unique feature. 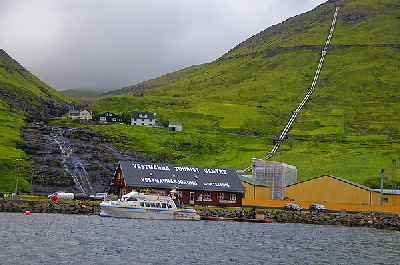 With a population of around 1,300, Vestmanna is considered in the Faroe Islands to be a "mid-sized" fishing village. 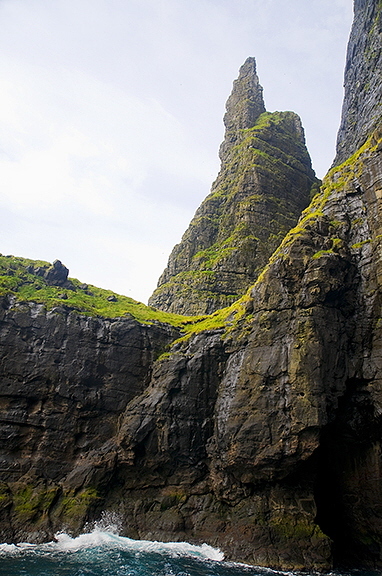 It's also home to one of the earliest hydro power plants in the Faroes. Similar plants are easily visible from the marina docks. Rainwater is collected in large dams in the higher elevations and transported through huge pipes down the steep mountainsides to several waterfront turbines that produce electricity for the nearby communities. Discoveries of Viking remains in Vestmanna also support the theory that this area was one of the first places in the Faroes to be settled. Even the name Vestmanna is a play on "men from west". Although hampered with some light rain and fog, our two-hour boat ride cruised by several salmon farms before reaching the beautiful mountainside. The captain motored very close to the beautiful 2,000 -foot-high cliffs, even entering some narrow grottos, caves and tunnels. The unique rocky cliffs are home of many types of birds, including the famous puffin, and their nests were tucked into the rock wall almost everywhere we looked. Passengers were given hard hats and some folks thought it was a precaution against falling rocks as we entered and exited the grotto tunnels. But more than likely, it was a precaution against falling bird droppings! It's interesting to think that people could live so isolated in our world yet still enjoy the modern comforts of internet, television and computers. Sometimes, we envy such isolation! No worries other than making a living.